This readme covers the most technical aspects of Wrye Bash, being the Wizard scripting language and the syntax used in Mod Checker rulesets. Information on the most commonly used aspects of Wrye Bash may be found in the General Readme, and the Advanced Readme holds information on more advanced and less commonly used features. Wrye Bash's version history is stored in the Version History document. <<, ^^ or >> at the beginning of a line generate a div align=left, div align=center or div align=right tag respectively. == text == generates a level 2 header. === text generates a level 3 header. __text__, ~~text~~ and **text** generate emphasised text. Bain Wizards allow mod authors to include a simple configuration script with their packages. Wizards run on a simple scripting language similar to OBMM script, contained in a wizard.txt file in the package. When run, the wizard will run through a series of windows to allow you to select options, then show a summary page at the end telling you which sub-packages and esps/esms will be selected, and any INI tweaks that will be applied. Those using Notepad++ to write their install scripts may want to use utumno's BAIN wizard Script Highlighter for Notepad plus plus as it features code folding and syntax highlighting to make spotting mistakes easier. There is a similar BAIN Wizard Syntax for EmEditor syntax highlighter for EmEditor created by broken85. You may use a number of different dialogues in a wizard. The available dialogs are described in this section. SelectOne - This dialog gives you a list of options, with the option to select one of them. It will be shown when a SelectOne keyword is used. Each option can display an image associated with it, and a description as well. To see a larger version of the image displayed, either right click or middle click on the image. 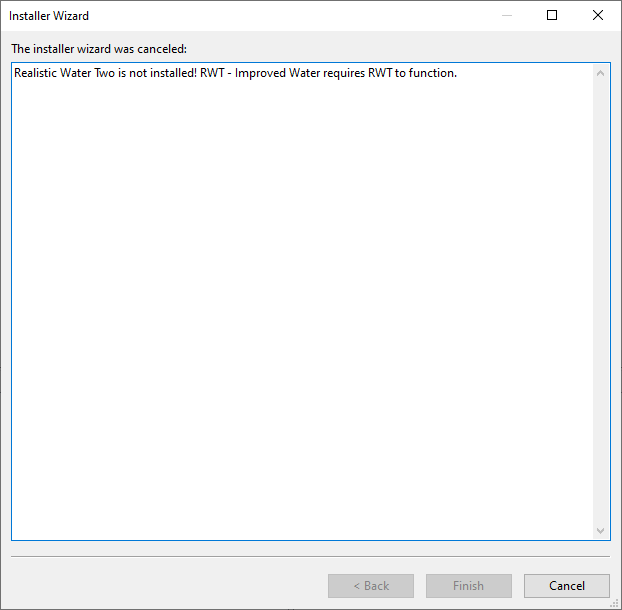 The wizard can specify a default answer, and if you are running it as an Auto-Wizard, then this page will be skipped, using the default option. SelectMany - This dialog gives you a list of options, with the option to select one or more of them, or even none of them. It will be shown when a SelectMany keyword is used. Each option can display an image associated with it, and a description as well. To see a larger version of the image displayed, either right click or middle click on the image. 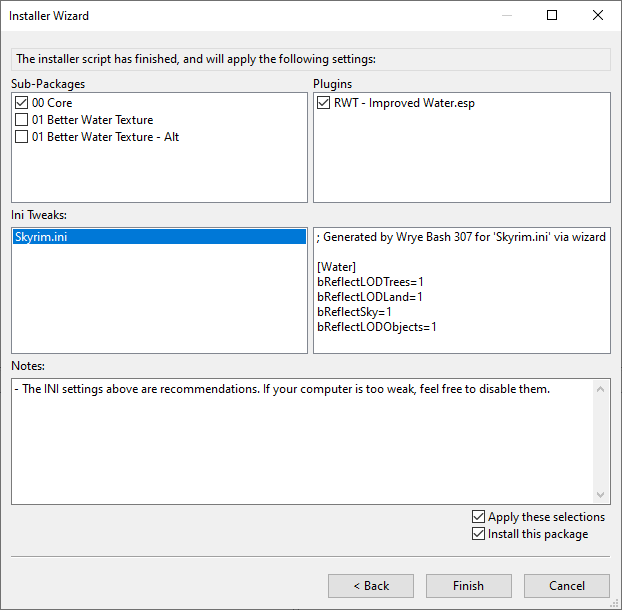 The wizard can specify default options, and if you are running it as an Auto-Wizard, then this page will be skipped, using the default options. Cancel - This dialog will be shown if the wizard cancels execution for some reason, activated by the Cancel keyword. If a reason is given, it will be displayed. Error - This dialog will be shown if the wizard encounters an error in the wizard file. The wizard will then quit. Finish - This dialog will be shown at the end of the wizard, to show you which sub-packages, esps, and esms will be selected. It will be shown either when the end of a wizard file is reached, or if the Return keyword is used. It also shows what INI Tweaks will be applied, and also serves as a place for any extra notes from the mod author to be displayed. 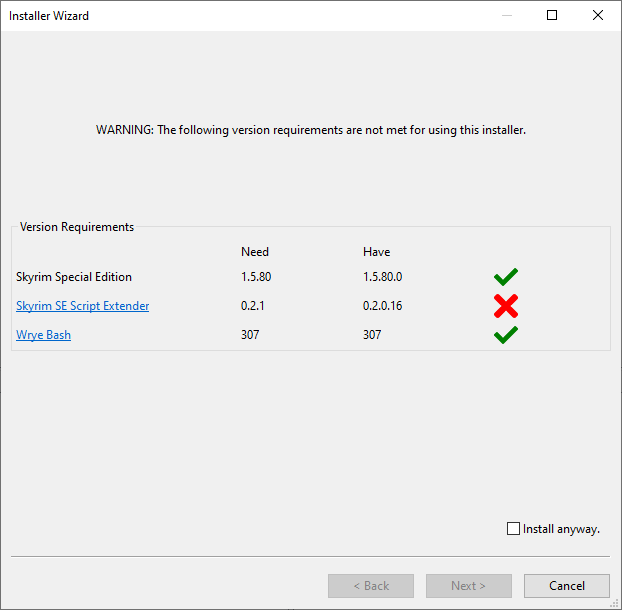 Version Warning - This dialog is displayed if the user's system doesn't meet the package's game, script extender or graphics extender requirements. Each line of a Wizard contains one statement. To carry a statement across multiple lines, end each line of the statement with a backslash \. This will cause BAIN to read the next line as if it were part of the first. Wizard syntax is case-sensitive, apart from filenames. Make sure when writing Wizards that you use the correct case. Integers: whole numbers that can be either positive, negative or zero. You can perform mathematical operations on integers using the mathematical operators. Decimals: real numbers that contain a decimal point, eg. 0.123, -3.5, 7.0. You can perform mathematical operations on decimals using the mathematical operators. Strings: any string of characters, eg. "Hello", 'World!'. As in the examples, strings must be enclosed within double or single quotes. Special characters may be included in strings by using an escape sequence. Strings can be added and multiplied using the addition and multiplication operators. One string may be checked for within another using the in operator. Constants are variables that are pre-defined by BAIN and cannot have their values changed. You cannot create new constants. Comments are extra text ignored by the Wizard engine, to explain what the Wizard code does to other readers. Comments begin with a semicolon ; and last until the end of the line. Expressions are evaluated using the standard order of operations, eg. 3 + 6 * 2 will evaluate to 15. Incorrect case. For example, make sure you're using SelectSubPackage and not SeleCtsUbpacKage. Mismatched quotes. Make sure that if you start a string with a double quote, you end it with a double quote, and similarly strings that start with a single quote should end with a single quote. Missing or extra backslashes at the end of a line. This causes an error or not all options to display. Referencing images that don't exist. Make sure any images you try to display in the Wizard actually exist. CompareObVersion - Used to test the installed version of Oblivion against the one you specify. Deprecated. Use CompareGameVersion instead. version_string - A string formatted to hold a file version number, eg. "1.2.0.416". -1 - Installed version is less than the version specified in version_string. 0 - Installed version is equal to the version specified in version_string. 1 - Installed version is greater than the version specified in version_string. CompareOBSEVersion - Used to test the installed version of OBSE against the one you specify. Deprecated. Use CompareSEVersion instead. version_string - A string formatted to hold a file version number, eg. "0.0.20.1". 1 - Installed version is greater than the version specified in version_string, or there is no Script Extender available for the game. CompareOBGEVersion - Used to test the installed version of OBGE against the one you specify. Deprecated. Use CompareGEVersion instead. 1 - Installed version is greater than the version specified in version_string, or there is no Graphics Extender available for the game. When specifying a path below the Data directory, use double slashes to indicate folder separation. For example assuming MenuQue.dll is installed correctly, "obse\\plugins\\MenuQue.dll" will work but "obse\plugins\MenuQue.dll" will fail. You can also look for files above the Data directory using the following syntax: "..\\SoundCommands.log"
When testing for multiple files, separate each file with commas. They do not have to all be in the same directory. Example: DataFileExists("Oblivion.esm","..\\SoundCommands.log","obse\\plugins\\MenuQue.dll") will accurately test to see if each of the files exist. True - All of the files exist. False - One or more of the files do not exist. file_name - A string or variable holding a string, specifying the path relative to the Data directory for the esp or esm to test. -1 - The esp/m does not exist. 0 - The esp/m is not active, imported, or merged. Its checkbox in Wrye Bash's Mods tab is . 1 - The esp/m is not active, but has portions imported into the Bashed Patch. Its checkbox in Wrye Bash's Mods tab is . 2 - The esp/m is active. Its checkbox in Wrye Bash's Mods tab is . 3 - The esp/m is merged into the Bashed Patch. Its checkbox in Wrye Bash's Mods tab is . file_name - The name of the ini file you wish to edit, relative to the Data directory. section - The section in the ini where setting resides, or 'set' or 'setGS' or 'SetNumericGameSetting' (see examples below). setting - The setting you wish to change. value - The value to set the setting to. comment - Optional comment to include with this tweak. lines - A string containing lines to execute, separated by newline characters, or a variable containing such a string. Any backslashes that are to be outputted must be written as triple backslashes. Eg. \' should be written \\\'. value - Any value. An integer, decimal, variable, constant or string. String representation of value. For example, str(5) would return "5". Integer value of value, if possible. For example int('65') would return 65. 0 - If integer conversion is not possible. Decimal value of value, if possible. For example int('2.4') would return 2.4. 0.0 - If decimal conversion is not possible. string - A string, variable, or constant. Length of the string if possible. 0 - If length calculation was not possible. string - A string, variable or constant. ending_1 through ending_n - A string, variable or constant. True - If the string ends in any of the endings specified. False - If the string does not end in any of the endings specified. prefix_1 through prefix_n - A string, variable or constant. True - If the string begin with any of the prefixes specified. False - If the string does not begin with any of the prefixes specified. string - A string or variable. string converted to lowercase if possible. The original string if an error occurred. string - A string or variable to search in. substring - A string or variable to search for. start - Index at which to start searching in string. If not specified, searching will start at the beginning of string. stop - Index at which to stop searching. Optional. If not specified, searching will stop at the end of string. The index of the first occurrence of substring in string. -1 - If substring could not be found. The index of the last occurrence of substring in string. path_string - A string or variable of the path to work with. An empty string, if path_string is not a path. An empty string if path_string does not contain a folder, or is not a path. Keywords are like functions, but don't require brackets around their arguments, and are used for controlling the flow of a wizard or performing special tasks. name - A string or variable holding the name of the sub-package to select. name - A string or variable holding the name of the sub-package to de-select. name - A string or variable holding the name of the esp or esm to select. name - A string or variable holding the name of the esp or esm to de-select. original_name - The name of the esp or esm, as it appears in the BAIN package. new_name - The new name you want to have the esp or esm installed as. text - A string, string variable, or expression that evaluates to a string, to be displayed on the finish page. text - Optional. Text to display in a dialog as to why the wizard was canceled. game_version - Version of the game to test for. See CompareGameVersion for the proper format of the string. se_version - Optional. Version of the Script Extender to test for. See CompareSEVersion for the proper format of the string. ge_version - Optional. Version of the Graphics Extender to test for. See CompareGEVersion for the proper format of the string. wrye_bash_version - Optional. Version of Wrye Bash to test for. See CompareWBVersion for more info. If - Begins the control block. statement - If statement evaluates to True, then the lines following it will be run, until the next Elif, Else, or EndIf. statement - If statement evaluates to True, and the initial If and none of the previous Elifs were True, then the lines following this Elif will be run, until the next Elif, Else, or EndIf. Else - If the initial If and none of the previous Elifs were True, then the lines following will be run until an EndIf is met. EndIf - Signals the end of the If control block. While - Begins the while loop. statement - If statement evaluates to True, execution of the lines begins, otherwise execution skips to after the EndWhile. Continue - Signals the while loop to begin over again at the While statement. Break - Signals the while loop to end execution, skipping to after the EndWhile. EndWhile - Ends the while loop. statement is re-evaluated, and if True, execution begins again at the start of the While block. For - Begins the for loop. There are three types of for loop. var - A variable that will hold values. start_value - Initial value of var. end_value - value of var that will end the for loop. increment_value - Optional. This the value that will be added to var at the end of each run of the loop. Defaults to 1 if start_value is greater than end_value or -1 otherwise. sub in SubPackages - This type of for loop iterates over the names of the SubPackages in the current package. sub - A variable that holds the names of the SubPackages. file in sub - This type of for loop iterates over the names of the files in the given subpackage. Filenames are relative to the Data directory, before any remapping that would normally be done by BAIN. file - A variable that holds the filenames. sub - The name of the subpackage to iterate through. Continue - Signals the for loop to begin over again at the For statement. Break - Signals the for loop to end execution, skipping to after the EndFor. EndFor - Ends the for loop. SelectOne - After the user presses the "Next" button, this begins a Select control block. description - The text that will be displayed at the top of the dialog. option n - The text of the specific option. If the text begins with a "|", this is considered the default option and will be selected by default. description n - The description to display when option n is selected. image n - The image to display when option n is selected. An empty string will make no image display. Case option - The lines following the Case will be run if the user selected its corresponding option on the dialog, until a Break or EndSelect is met. option - The option that the Case corresponds to. Default - The lines following the Default will be run, until a Break or EndSelect, if none of the Case options have been run. Break - Stops running lines in the current Case or Default block. EndSelect - Signals the end of the Select control block. Assignment operators are used to assign values to variables. Compound assignment operators are a combination of assignment operator and mathematical operator, performing the operation and assigning it to a variable in one step. Mathematical operators allow you to add, subtract, multiply, divide and exponentiate integers and decimals. The addition and multiplication operators can also be used on strings. Boolean operators can be used to test the logical truth of values. Comparison operators are used to compare two values or variables with one another. start: The index to start at. The first item in a sequence has an index of 0. If not specified, indexing will begin at 0.
stop: The index to stop at. If not specified but a colon : is supplied, indexing will continue to the end of the sequence. If not specified and no colon is supplied, only one character will be indexed. step: How much to increment by when indexing. For example, a value of 2 would return every second item in the sequence. If not specified, a value of 1 will be used. Negative values for start and stop will be relative to the end of the sequence. For example, -1 would mean the first character from the end of the sequence. Examples: "Hello" ;returns "H" "Hello"[0:] ;returns "Hello" "Hello"[:] ;returns "Hello" "Hello"[0:2] ;returns "He" "Hello"[-1] ;returns "o" "Hello"[1:3] ;returns "el" "Hello"[-2:] ;returns "lo"
Only two constants are defined in BAIN Wizards. True - True. Equal to boolean true (text representation) or 1 (binary representation). False - False. Equal to boolean false (text representation) or 0 (binary representation). \": Outputs a double quote character ". This allows you to put quotes in a string without causing the Wizard engine to think it's reached the end of the string. \': Outputs a single quote character '. This allows you to put quotes in a string without causing the Wizard engine to think it's reached the end of the string. \n: Outputs a new line. \\: Outputs a backslash \. The following mods have Wizard scripts that may be useful references: Animated Window Lighting System and Chimneys - AWLS, Bain Conversion Files, Bananasplit Better Cities, Fast and Easy Frans WIZBAIN Archive Maker -ENGLISH ONLY-, Metallicow Cursor Mod, Unique Landscapes Compilation, Weather - All Natural. Would return an empty string. This section compares the functions and keywords available in Wizards against those available in OBMM scripts. If VersionGreaterThan <version> If VersionLessThan <version> Use CompareWBVersion to check the Wrye Bash version. Message <Message> [Title] DisplayImage <Image File Path> [Title] DisplayText <Text File Path> [Title] Similar functionality can be reproduced using Note and SelectOne or SelectMany keywords. ConflictWith <ModName> [Comment] [Level] DependsOn <ModName> [Comment] [Level] Similar functionality can be reproduced using If DataFileExists(modname). DontInstallDataFile <FileName> InstallDataFile <FileName> DontInstallDataFolder <FolderName> [RecurseSubfolders] InstallDataFolder <FolderName> [RecurseSubfolders] CopyDataFile <CopyFrom> <CopyTo> CopyDataFolder <CopyFrom> <CopyTo> [RecurseSubfolders] Similar functionality can be obtained by packaging the mod differently, and then using SelectSubPackage and DeSelectSubPackage. and other string manipulation functions to test file names and folders. PatchDataFile <NewFile> <FileToPatch> [Create] PatchPlugin <NewFile> <FileToPatch> [Create] Unnecessary due to BAIN's conflict resolution abilities. AllowRunOnLines Wizards support run-on lines as standard. Rulesets allow the expansion of Wrye Bash's Mod Checker to analyse active load orders based on additional rules. There can be any number of ruleset files, which must be plain text files located in [Game]\Data\Bash Patches, with filenames ending in Rules.txt, for Wrye Bash to recognise them. A header containing the ruleset name, and any supplied header text. Warnings for any rules violated. Any include, exclude or merge only warnings generated. The NOTES command lets you output notes to the Mod Checker report. The possible formatting options are given in the formatting sub-section below. Notes can be multiline. The IF command is used to specify that the NOTES, CONFIG, SUGGEST and WARN commands following it are conditional on the existence of the plugin(s) specified as part of the IF command. The effect of an IF command lasts until the next IF command or the end of the file, whichever comes first. If the IF command lists more than one plugin, then the condition statement is a logical AND combination of all listed plugins. You can also specify logical OR and NOT combinations. |: This is the symbol for an OR combination of the previous plugin and the following plugin. -: This is the symbol for a NOT combination of the following plugin. The above equates to Alpha AND (Beta or Gamma or Delta) AND NOT(Epsilon) AND NOT(Zeta or Eta) AND Theta. The o symbol denotes an Option rule type. x: Inclusion rule type. The specified plugin must be active. If the plugin is not active, the Mod Checker will output a message. -: Exclusion rule type. The specified plugin must not be active. If the plugin is active, the Mod Checker will output a message. +: Merge Only rule type. The specified plugin must be merged but not active. If the plugin is active or inactive and not merged, the Mod Checker will output a message. e: Existence rule type. The specified file must exist. The file can be any file type, with the file path being given relative to the Data folder. If the file does not exist, the Mod Checker will output a message. The ASSUME command inserts the assumption that the given plugin exists into any IF statements following the command. ASSUME commands last until the next ASSUME command or until the end of the file, whichever occurs first. ASSUME commands are not additive: each ASSUME command completely replaces the previous one. To cancel the effect of an ASSUME command, use an ASSUME command with no mod listed for it. To assume the existence of multiple plugins, list them on separate lines after the ASSUME command, like how is done for the IF command. The example ruleset below is a simple ruleset for Cobl. >> HEADER This ruleset covers Cobl (Common Oblivion) and related mods. >> ONLYONE Cobl Races - Balanced.esp bgBalancingEVCore.esp >> IF Cobl Main.esm >> CONFIG o Cobl Glue.esp // Glues Cobl items into vanilla lists, cells o Cobl Si.esp // Glues Cobl items into Shivering Isles cells. o Cobl Tweaks.esp // Adds Cobl items to creatures and NPCs. o Cobl Races.esp // Additional races, hairs, eyes. o Cobl Races - Balanced.esp // Races and birthsigns given better balanced pros and cons. o Salmo the Baker, Cobl.esp // Enhances Salmo the Baker in Skingrad. o Cobl Filter Late.esp // Adds foods from various mods to the Dinner Plate. (Requires OBSE.) >> SUGGEST - Denock Arrows.esp // **Deactivate** and use Cobl Denock instead. (See Options menu.) ## HOMES - AlchemistsCave.esp // Use [[http://planetelderscrolls.gamespy.com/View.php?view=OblivionMods.Detail&id=3996|Coblized version]] instead. - Jagnot-SI-Bliss Aquaduct House.esp // Use [[http://ljosa.proboards57.com/index.cgi?board=releases&action=display&thread=548|Coblized version]] instead. - PrincessImperialCityApartment.esp // Use [[http://planetelderscrolls.gamespy.com/View.php?view=OblivionMods.Detail&id=3997|Coblized version]] instead. - PrisonersCampsite.esp // Use [[http://planetelderscrolls.gamespy.com/View.php?view=OblivionMods.Detail&id=4106|Coblized version]] instead. - SkyShip.esp // Use [[http://ljosa.proboards57.com/index.cgi?board=releases&action=display&thread=548|Coblized version]] instead. >> WARN ## Required e meshes\Cobl\StaticApp\apparatusalembics.nif // __Missing meshes [StaticApp].__ Try reinstalling full Cobl package (including all textures/meshes). ## Obsolete components - Cobl Glue MW Ingred.esp // **Deactivate. ** Obsolete. (Merged into Cobl Glue.esp.) ## Superceded mods. - Beer! for Oblivion.esp [1.2.3:]-- **Deactivate. ** Included in Cobl Main.esm. - DaggerfallBooks.esp // **Deactivate. ** Included in Cobl Main.esm. - FirstEditionGuidetotheEmpire.esp // **Deactivate. ** Included in Cobl Main.esm. - Ingredient Storage Shelves.esp // **Deactivate. ** Included in Cobl Glue.esp - MorrowindBooks.esp // **Deactivate. ** Included in Cobl Main.esm. - Salmo the Baker v2.0.esp // **Deactivate** Use Salmo the Baker, Cobl instead. - Tamrielic_Ingredients.esm // **Deactivate. ** Included in Cobl Main.esm. - Tamrielic_Ingredients.esp // **Deactivate. ** Included in Cobl Main.esm. >> ASSUME Cobl Main.esm >> IF Cobl Races.esp >> WARN e meshes\characters\saram\femalehair\type0\01.nif // __Missing meshes [Saram].__ Be sure that you have installed [[http://oblivion.nexusmods.com/mods/21104|Cobl Cosmetics Res 01]]. e meshes\clothes\asxivilai\xivilaicollar.nif // __Missing meshes [xivilai].__ Be sure that you have installed [[http://oblivion.nexusmods.com/mods/21104|Cobl Cosmetics Res 01]]. x DLCShiveringIsles.esp // **Activate** Required (meshes and textures). >> IF Cobl Races - Balanced.esp >> WARN x Cobl Races.esp // **Activate. ** Required. >> IF Cobl Si.esp >> WARN x DLCShiveringIsles.esp // **Activate. ** Required. ## Patch Mods ---------------------------------------------------------------- >> IF FF_REAL_Thirst.esp >> SUGGEST x FF_REAL_Thirst, Cob.esp // Patch FF Real Thirst to work with Cobl water wells.